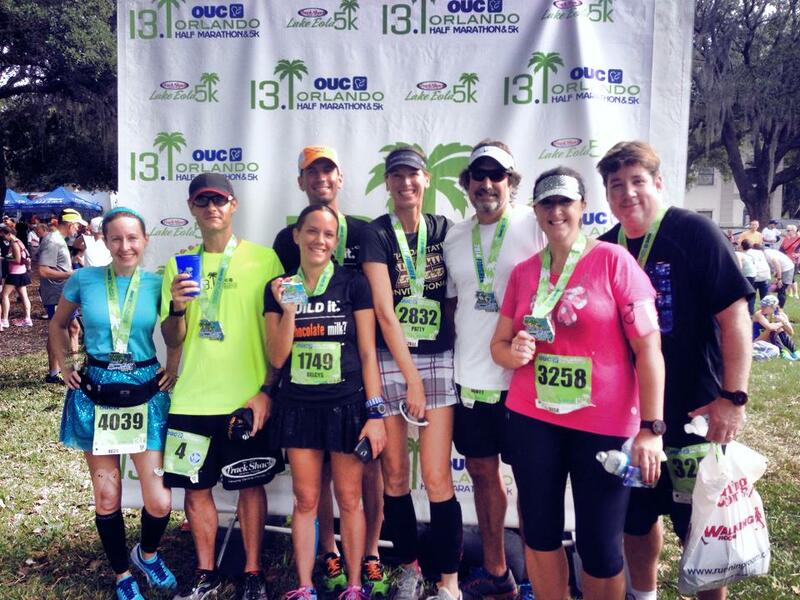 This Saturday I ran the OUC Orlando Half Marathon, making it my most epic race of all time! 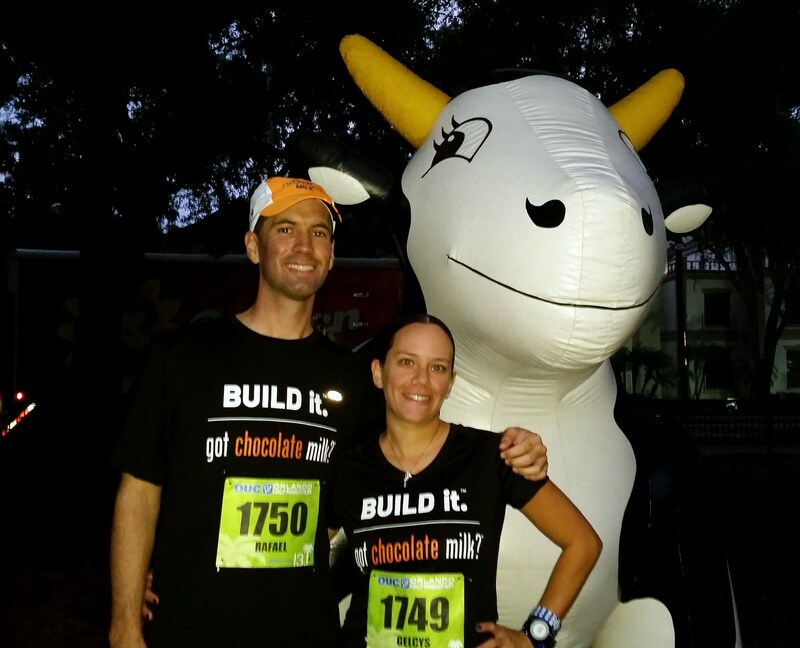 I am still deep in training for the Goofy Challenge in January so I knew this race wasn’t going to be a problem. Even though there was almost 2 and a half miles of brick covered pavement, I knew it was going to feel longer lol. 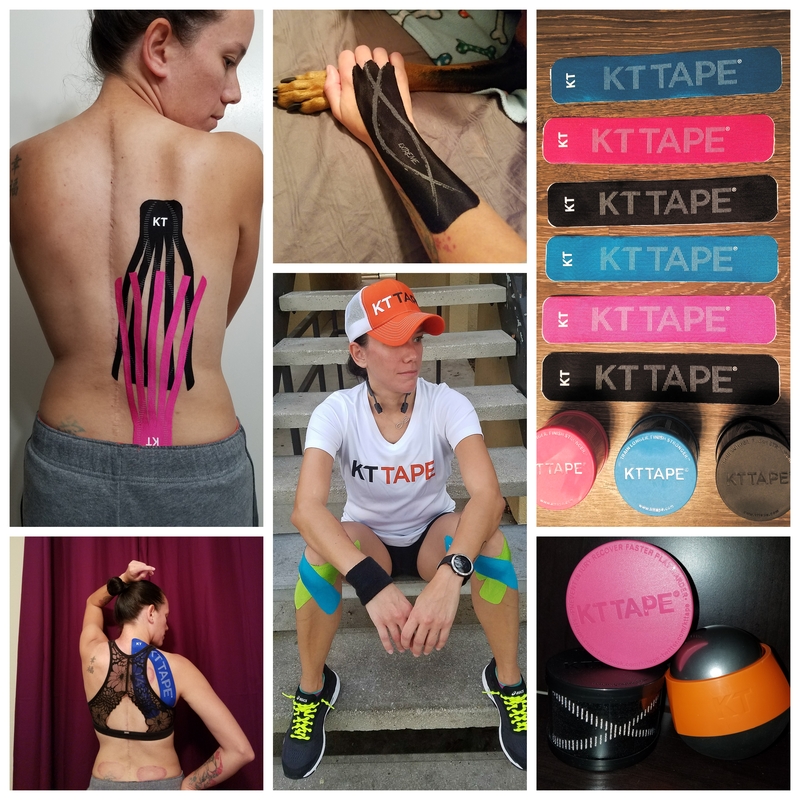 The day started off by drinking my two cups of CogniTea, and Alpha putting KT Tape on my back, hamstrings, and calf. We left real early to meet up with our Florida Milk teammates. We stretched, warmed up, and used the bathrooms more than once. 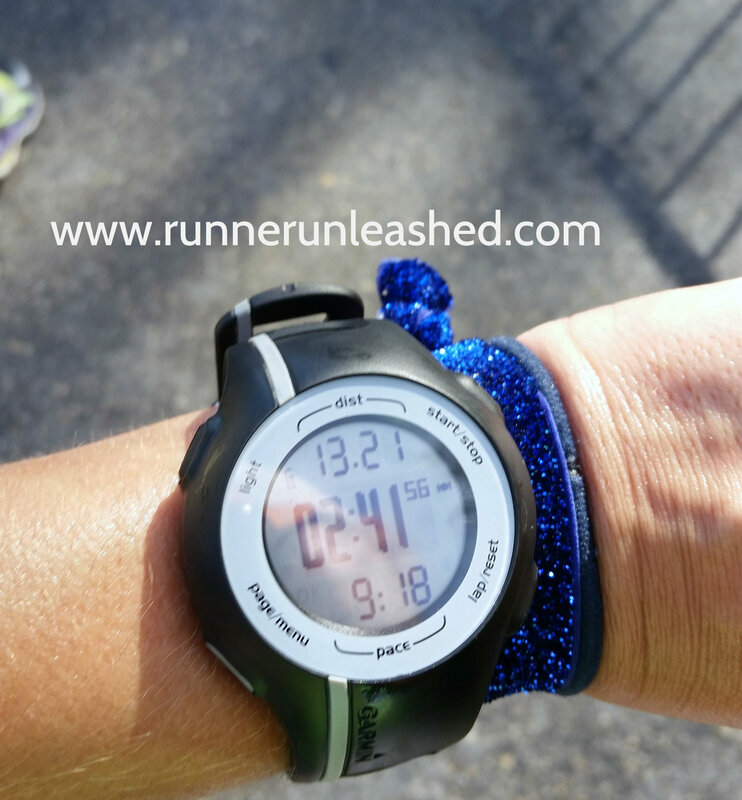 As we headed to the start line, I looked down at my 2:45 paceband goal time. I wondered how close if anything I would get to that goal. 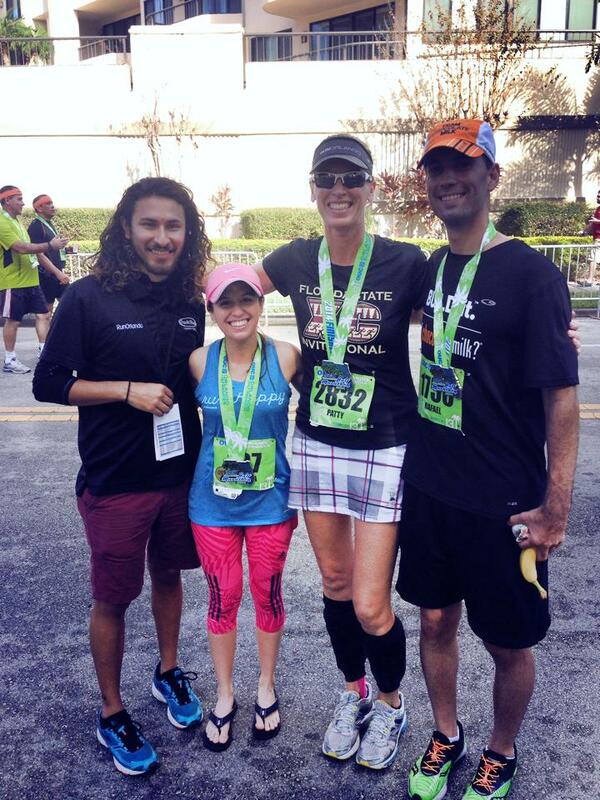 I ran the Wine and Dine Half weeks ago and came close with 2:50. I was familiar with the terrain and uneven road so I wasn’t expecting much. As we were off, I noticed that the 2:45 pace group was up ahead of us. I knew that if I kept the distance between us the same, I was set to make my goal time. I was running it at about a minute faster than needed and a few times I thought I should slow it down to avoid getting burned out later on. I was feeling good and had an excellent comfortable stride that I didn’t want to break it. It was a pace that I didn’t need to stop for breaks and that us a huge deal for me so I just stuck with it. We passed mile after mile and quickly approached the half way mark and I was still going strong. The 2:45 pace group was still at the same distance so I thought, well maybe I just might make my goal time! Then at around mile 8 I started having hip pain. Because the bricks were uneven and they dipped, were broken, it made me challenging for me. Since I already have uneven hips, this just aggravated them. Alpha noticed that something was up but he doesn’t bother me. We communicate through hand signals being that I usually listen to music or I’m counting. I signaled to him that I wasn’t doing well so he asked if we should stop and I said no. One thing I am grateful for, Track Shack puts lots of hydration stops so I don’t need my hydration belt. I was never dying for water because there would be one literally right around the corner. I was alternating water and the powerade they had. But at around mile 10.5 I had to stop, Alpha was concerned but nothing major. It was a new pain I was dealing with but it wasn’t completing beating me up. At this point I lost sight of the 2:45 pace group, but I didn’t lose hope. I was doing the math in my head with each mile and saw that I was 3 minutes faster than needed. At almost mile 12, I had to stop again, since I was running it still at a minute faster than needed, I knew I had some time to rest. Alpha and I both realize that I was on target to finish in that 2:45 time I wanted. I knew that even if I walked at a fast pace, I might just make it but I needed to run. I found the strength I needed and kept pushing. The closer I got, the more time I had to finish, the more the adrenaline built up. I could hear the crowd, I could hear the cheers, the high 5s and those telling us the finish line was just around the last corner. I ran around and there it was in huge letters…FINISH. I looked down at my Garmin one more time and saw that it was not only under 2:50, but under 2:45! I couldn’t believe it!!!! Once I crossed that finish line in 2:41:54 I just broke down crying. I had done it again!!! Alpha just hugged me and kept repeating how proud of me he was. Holy PR Batman!!! I had done it! ANOTHER PR! 9 minutes from the Wine and Dine Half a few weeks ago, 4 minutes faster than my target! I was happy to see my friend who worried when he saw me crying but I told him why and he was just as proud of me. I kept walking, got my post run fuel and headed straight to ice my back. A group photo of some incredible athletes! Alpha with our friends Andres, Teri, and Patty! These people are so dear to my heart. Always supportive, always positive. Once I came back to our team tent, I sat down and stretched. Lots of sore areas that needed some attention. But feeling better, more of you kept coming around and it just made me happier! So many of you are inspiring and strong! Keep fighting and keep doing the imPOSSIBLE runners! I want you all to share, repost, comment, like this post because I want everyone to see what happens when you work hard, stay positive, and keep focus on your dreams. I am coming from not being able to run .20 to running a half marathon in 3:08, to now completing it in 2:41! NOTHING is impossible despite what others may tell you. I’ve said it again and again, but the most important tool to have to succeed is to BELIEVE IN YOURSELF!!! No one else besides you will have to train, no one else besides you will wear your bib number, no one else besides you will get you across the finish line. YOU are the strongest tool you have to be a successful runner!!!!! I am here to share my struggles with Scoliosis and share my accomplishments to show you that YOU CAN do it. I have lots of health issues to deal with as side affects from surgeries and the twisted spine itself, but that is not an excuse for me. That is just a reason to push myself so I can prove that I can do it. I am not a fast runner and I don’t compete with anyone else but myself. I’m not looking to win an award, or beat everyone on course. Whenever I cross each finish line, it makes me feel like I have already won. Thank you! =) Hope to see you then! How’s the training going? Doing well. I think I scheduled too many December races but I’m still learning. Previous Previous post: Today is CHEETAH day!